I can’t wait till the weather is nice enough that we can start enjoying the outdoors again. I miss barbecue season! It’s never to early to start getting ready especially when there’s a good deal going on like Sears #GrillingisHappiness sale. Sears is unveiling its latest collection of chic and affordable patio designs from February 21st to 24th at Food Network’s South Beach Wine & Food Festival in Miami! At the festival, Sears will be showcasing their exclusive lighted patio line and Kenmore grill. Here’s a preview of a few of the the products featured. Kenmore Elite 3 Burner Dual Fuel Stainless Steel Gas Grill: Perfect for beginner or seasoned grill master with a total of 702 square inches of overall grilling space. Lighted Patio Furniture: Includes the Bella Luna Collection by Agio & Halley Collection from La-Z-Boy Outdoor to show off your patio in a new light. Check out this video to learn more about these fabulous outdoor products from Sears. 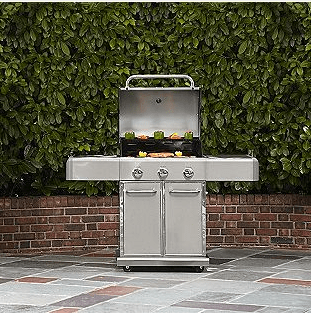 Sears is proud to have Ty Pennington and George Hirsch serve as hosts of the Grilling is Happiness Lounge featuring these unique lines in a wide range of styles and price points. Visit Sears.com and let their design team help you extend your living space to the outdoors. I bought a really nice gas grill at Sears about 2 years ago, and last year they marked down an outside table and chairs for about 75% off. I can not wait to sit outside in my new chairs soon! I love to BBQ me and my husband need a good grill for the summer, I’ll check into this grill from Sears! I love Sears–and I’m looking forward to spring! My family loves to grill. That would be great for my fam!!!! I like the lighted table. Fun. BBQ here we come! Can’t wait for nice sitting outside weather without winter clothing! I really can’t wait for summer. I am so tired of winter. I love the Lighted Patio Furniture. what a great idea. I could BBQ everyday, I love ribs and chicken done on the BBQ. The lighted patio furniture is awesome and would love to own it for my backyard. Will have to look for them this spring at Sears! I love that BBQ taste and smell when we grill out. We also have a SEARS grill. Our grill is under our open car port, so we use whenever we can, even in the Winter. I would love to take advantage of this sale! I love that grill. I’ve been wanting to get my fiance a new one this year.